Only eight questions this week, mostly because I didn’t have the energy to answer any more than that after wrapping the annual Top 30 Prospects List. That’ll be posted later today. Anyway, send your mailbag questions to RABmailbag (at) gmail (dot) com. Ray asks: While I hate the idea of including a prospect to off load the Jacoby Ellsbury contract, it seems to be that’s the only way any deal happens. Assuming Ellsbury would only get $4 million on so on the open market, what type of of prospect (hypothetically) would the Yankees have to include to facilitate a trade and pay all but $12 million of his deal? Would any team even be interested? As I said, not ideal, and I probably wouldn’t even advocate, but I’m curious. Yeah, it sure seems the only way the Yankees will be able to trade Ellsbury is by attaching a prospect to him, similar to the Chase Headley salary dump. And that’s assuming Ellsbury agrees to waive his no-trade clause. Right now, why would a team take on Ellsbury as a straight salary dump when you could sign, say, Jon Jay or Carlos Gomez to a one-year deal? Attaching a prospect is the best (only?) way to incentivize a team to take on Ellsbury. The Padres really like Mitchell, apparently. It seems the Padres thought they’d be able to flip Headley elsewhere quickly. It was not yet clear the free agent market would be so slow-moving. … and none of that applies now. Maybe the Giants (or Diamondbacks, or Indians) really like Luis Cessa and are willing to take on Ellsbury at $4M per season to get him. If I were another team, I’d ask for someone like Tyler Wade or Albert Abreu in an Ellsbury deal, then negotiate down from there. Make it really worth my while. In hindsight, the Yankees did well unloading Headley’s salary given how no one is spending money this winter. They could potentially replace Headley’s production with Neil Walker at a friendlier salary. I’d be shocked if it happens with Ellsbury. R.J. asks: Mike, who wins this game of chicken, the free agents or the luxury tax line? It seems like the fans are the ones losing right now. It bugs me that money is the only thing standing between Yu and adding a major piece to potentially win another championship this year. The luxury tax threshold will win this free agency standoff. The owners are going to make their millions anyway. The players are the ones without jobs. Some free agents have already made a fortune and can be patient, even if it means signing after Opening Day. What about a guy like, say, Jonathan Lucroy? He’s earned $15.9M in player contracts so far, though it’s actually much less than that because of taxes and union dues and all that. Eventually he’s going to cave and sign a smaller contract than expected because some money is better than no money. MLB careers are short. You’ve gotta cash in while you can. I thought there would be more free agent activity this week than there has been because I thought guys would start to panic and sign. I’m sure their wives and families are on them, wanting to know where they’ll live this year and stuff. Maybe that’ll happen next week, once Spring Training begins. Rob asks: In the 90’s the Yanks got big contributions from Boston’s home-grown stars Wade Boggs and Roger Clemens and the Mets’ home-grown stars Dwight Gooden and Darryl Strawberry. Have any Yankees’ home-grown stars ever helped our rivals? Not really. Not to the extent guys like Boggs and Clemens helped the Yankees. The best example with the Mets, by far, is Al Leiter. He was drafted by the Yankees, played with them briefly from 1987-89, then was traded to the Blue Jays for Jesse Barfield. Leiter bounced from the Blue Jays to the Marlins before winding up with the Mets from 1998-2004. Orlando Hernandez spent some time with the Mets at the end of his career, but didn’t have any impact. As for the Red Sox, the most successful homegrown Yankee to wind up in Boston is probably Mike Lowell. The Yankees traded him to the Marlins in 1998 and he wound up in Boston from 2006-10. Won a World Series MVP award along the way. Ramiro Mendoza went to Boston and was a disaster. Had a 5.73 ERA in 97.1 innings. Elston Howard finished his career in Boston back in the day. I think that’s about it. Leiter and Lowell are the best examples of a homegrown Yankee having success with the Mets or Red Sox. If I’m missing someone obvious, let me know. Update: Jackie Jensen started his career with the Yankees (1950-52) before eventually moving on to the Red Sox (1954-61). He was named AL MVP in 1958 and received MVP votes in four other seasons. Mike asks: With much of the focus on Gleyber regarding service time and him remaining in AAA for 3 weeks to push back his free agency, how much time would Andujar have to spend in AAA to do the same? I’m assuming it is roughly 6 weeks. Is it worth it to try to push back his free agency or is this something that should only be considered for elite prospects like Gleyber? The Yankees didn’t call Miguel Andujar back up to the big leagues on September 1st last year. He stayed with Triple-A Scranton until they were eliminated from the postseason. Because of that, Andujar only has 20 days of big league service time. It takes 17 days to delay free agency now, so he’d have to go down for 37 days total to delay free agency a year. Call it six weeks just to be safe. Delaying free agency is a decision that gets made on a case-by-case basis. With an elite guy like Gleyber Torres — or Gary Sanchez, remember all the talk about sending him down for 35 days two years ago? — buying that extra year of control is a no-brainer. Pitchers get hurt too much to worry about seven years down the line. When they’re ready, bring them up. I’m the biggest Andujar fan you’ll find, but I’m not sure I’d sweat service time with him. If he can help you win now, get him on the roster. I’m too old to sit through six weeks of Ronald Torreyes or Danny Espinosa at third base. Simon asks: Last year, Gleyber Torres was the #2 prospect in all of baseball behind Benintendi. Now he’s number 5. Did his prospect rank dip because of the injury or did 4 prospects leapfrog him because of their development and ability? Is it something else? A little of Column A, a little of Column B. Torres is still a top six prospect according to all the major scouting publications, so it’s not like he fell off the map. He suffered a major injury and slipped a few spots in the rankings. I don’t think that’s unreasonable. Also, Shohei Ohtani came over and he is prospect eligible, plus some other prospects had monster seasons — Ronald Acuna and Vlad Guerrero Jr., most notably — which shot them up to the top of the rankings. Torres got hurt and a few prospects moved ahead of him. Not a big deal. 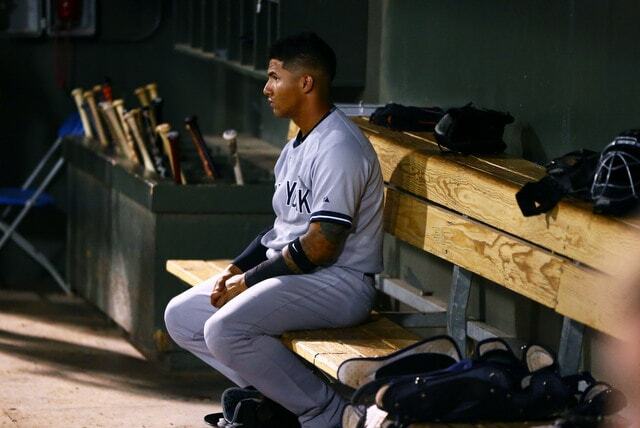 Gleyber is still one of the best prospects in the game and a budding star. Ted asks: I just read your piece on the new members of the coaching staff. I’m so used to hearing about all the drills Tony Pena had for the catchers. Any idea who is going to coach the catchers this year, Josh Bard? Does it matter to have a designated person? Jason Brown, who was one of the bullpen catchers last season, is now the catching coach. That’s his title. So I guess it’s up to him to improve Sanchez’s defense. In reality, it’ll be a collaborative effort. It wasn’t only Pena who worked with the catchers in the past. Joe Girardi and former bullpen coach Gary Tuck helped out too. I’m sure Bard and P.J. Pilittere will help Brown and Sanchez (and Austin Romine). Bill asks: If the Yankees could go back and undo the Stanton trade because after looking at the market they realized they could get a Darvish/Walker and maybe something else for the same price do you think they would? I know Stanton is amazing but the other pieces might have been able to fill bigger needs for similar costs. I don’t think so. Elite hitters are the most valuable and “safest” commodity in the game, and Stanton is a special case even among elite hitters because he is the game’s best power hitter. Yu Darvish is 31 with nearly 2,200 career innings on his arm, and his elbow has already blown out once. Walker has a history of back problems and it’s entirely possible the Yankees can sign him and stay under the luxury tax threshold anyway. Stanton is in his prime and his $22M luxury tax hit is pretty darn good relative to other top hitters. Mike Trout makes $34M a year nowadays. Bryce Harper will make $21.6M this season and lots more once he becomes a free agent. This would be a fair question if the Yankees had acquired, say, 32-year-old Evan Longoria when Todd Frazier couldn’t find a job. A just turned 28-year-old Stanton though? Nah. Give me Stanton over any available free agents. John asks: With a Labor and Union taking shots at each who do you think about adding a “My Bad Clause.” An example is: The Yankees want to stay under 197 number this year. They cut Ellsbury and still pay his contract but it does count against the cap/tax. 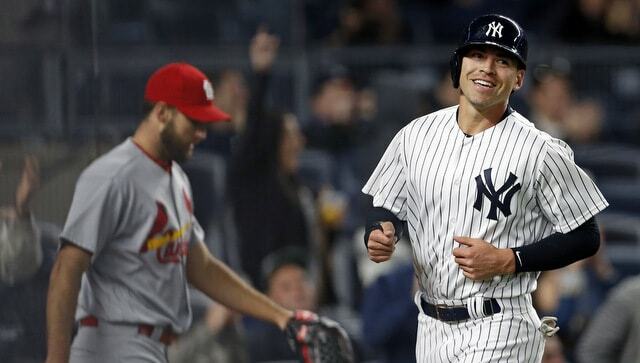 A new team signs Ellsbury at new contract with another team, or sits out and collects a salary. The Yankees then sign Yu Darvish. It’s a start? The NHL had amnesty buyouts following their last few work stoppages. Each team was able to buy out two players without having them count against the salary cap. The player still got paid, but he was off the books for salary cap purposes. This wouldn’t work in baseball because only a handful of teams would be able to use these buyouts. Five teams (Yankees, Dodgers, Tigers, Giants, Nationals) paid luxury tax last year and even fewer will pay this year. It’s not fair to the other 20-something teams that the Yankees get a get out of jail free card and they don’t. This would be wonderful for the Steinbrenners. Not happening though. As far as I’m concerned, if you give out a terrible contract, you should have to deal with the consequences.